This Flemish Renaissance gown can be worn three different ways: the inner gown can be worn over a chemise alone (chemise sold separately), the outer gown can be worn with a chemise, or you can wear the inner and outer gowns together over a chemise. We picture the gown with our Ruffled Chemise, but the Classic Chemise works just as well. 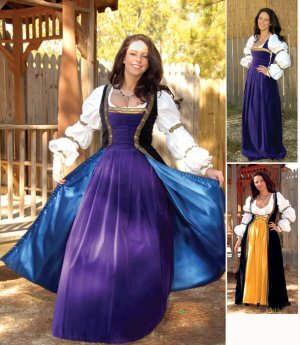 Both gowns are made from cotton velveteen and have a pleated skirt sewn to the bodice. The inner is half-lined with satin and the outer gown is fully lined in contrasting satin (colors vary) so when you walk the gown flashes brilliant colors. Each look can also be worn with ribbons (not included) tied around the arms, as shown, which help hold back the bulk of the chemise sleeves.